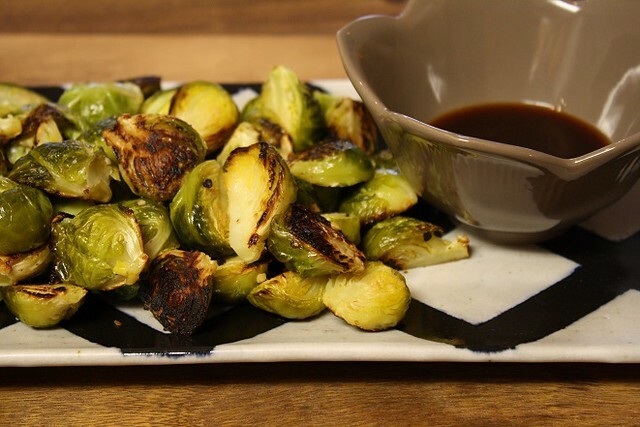 All you need to make this Roasted Brussels Sprouts with Honey Sriracha Drizzle dish in your own home is the following: Minced Garlic, 1 pound of Brussels Sprouts, Coconut Oil, Salt, Sriracha Chili Sauce, Honey and Soy Sauce (I always opt for low-sodium soy sauce). Start off by preheating the oven to 400 degrees. Then it’s time to work with the Brussels sprouts. I rinsed the sprouts and patted them dry. Then trim the stem and peel the outer leaves away and then cut each one in half. Here they are…all 1 pounds of glorious-ness! Grab a cast iron skillet if you have one or I just chose an oven-safe skillet. Heat 1 tablespoon of coconut oil in the pan over medium high heat. 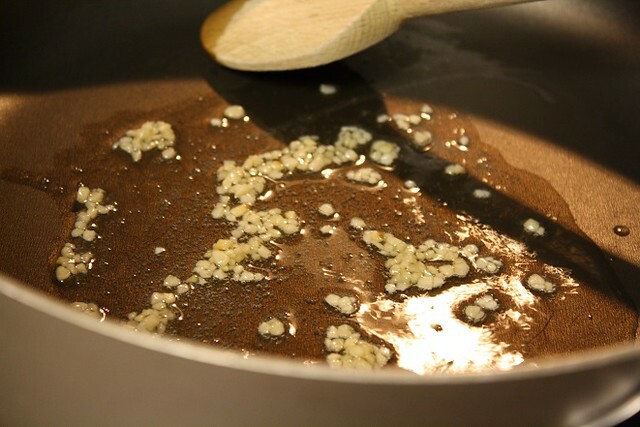 Heat 2 cloves of minced garlic in the oil for about 30 seconds. Add the halved sprouts and 1 teaspoon of salt and saute for an additional 30 seconds or so. While the veggies roast, whip up the sauce really fast in a small bowl. 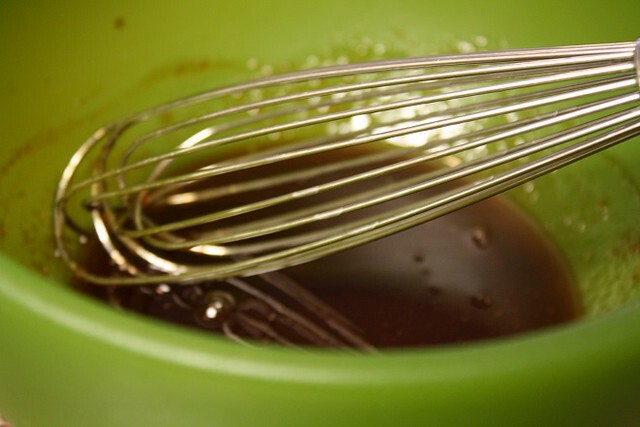 It’s just 1 tablespoon of honey, 1/2 tablespoon of Sriracha sauce, and 1/2 teaspoon of soy sauce. Whisk, whisk, whisk and then set it aside. Here are the sprouts in all their glory. Holy moly these smelled great! 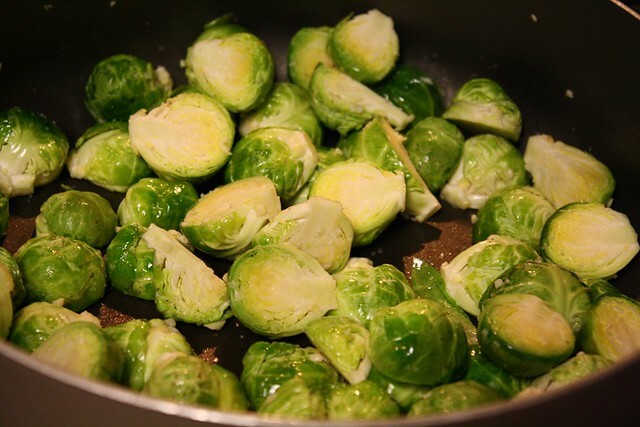 Then plate the sprouts and serve with the sauce on the side. A little sauce goes a long way but it is simply fabulous and kicks up the sprouts to a new level. Serve these as either a side or as a main dish served with some rice. Did I mention that wow this was delightful? Cuz it was! Happy roasting my friends! 2. 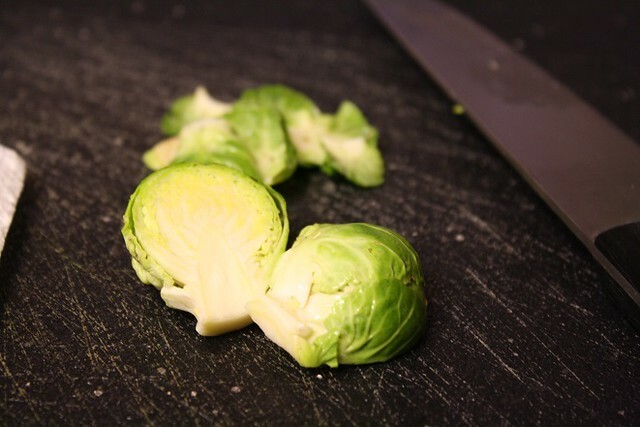 Trim the ends off of the Brussels sprouts and cut in half, or into quarters if the sprouts are super large. 3. 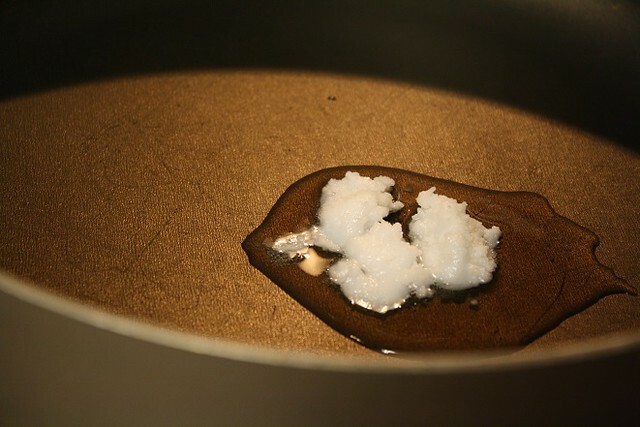 Melt the coconut oil in a cast iron skillet over medium high heat. Then saute the garlic in the oil for about 30 seconds, then add the Brussels sprouts and salt, and saute for another 30 seconds. Remove the skillet from the heat and place into the preheated oven. 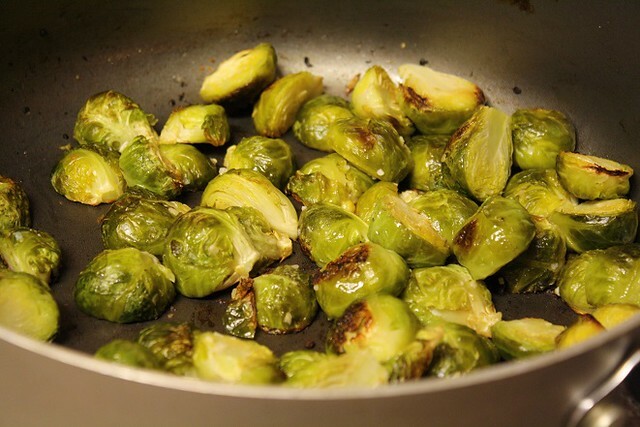 Roast for 25 minutes or until the edges of the Brussels sprouts caramelize and turn golden to medium brown. 4. 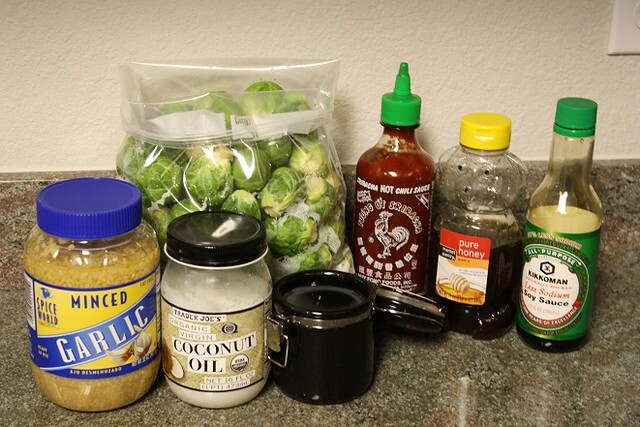 While the Brussels sprouts are roasting, prepare the Sriracha honey drizzle. 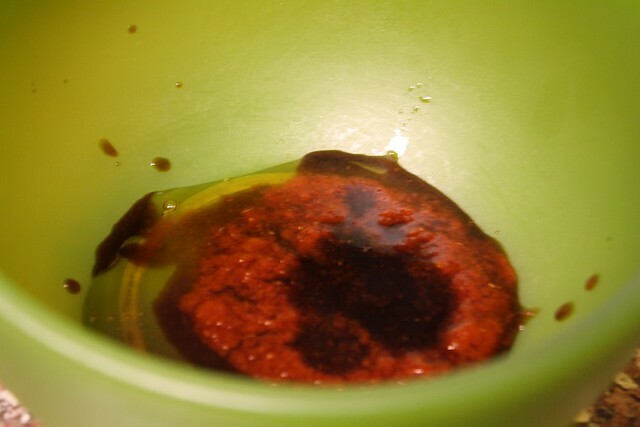 In a small mixing bowl, combine the honey, Sriracha and soy sauce. Stir to mix well, then set aside. 5. When the Brussels sprouts are done, remove from the oven and transfer to a serving platter with the Sriracha honey drizzle on the side. 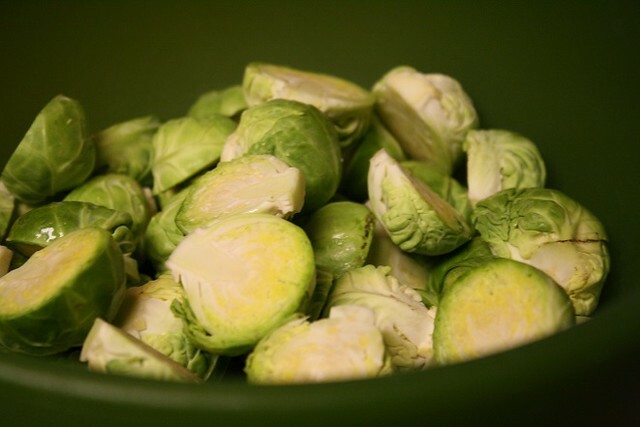 Serve Brussels sprouts immediately as a side dish or with rice. 1. You can also use a roasting pan to roast the vegetables. If using a roasting pan, use olive oil instead of coconut oil. 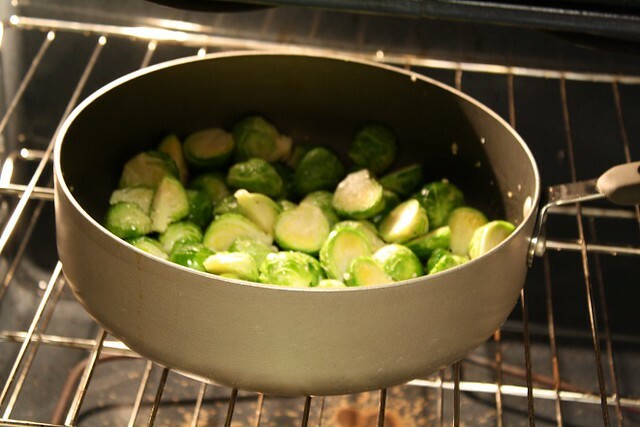 Mix the Brussels sprouts, garlic and olive oil in a mixing bowl and spread out on the roasting pan and roast according to above instructions. 2. 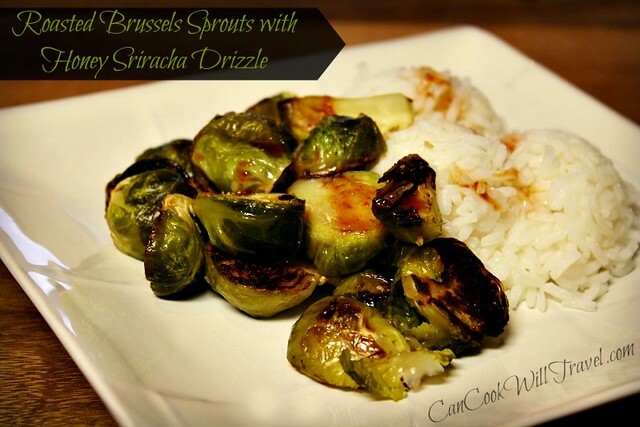 The Brussels sprouts are also great without the Sriracha honey drizzle, just add an extra pinch of salt before roasting. 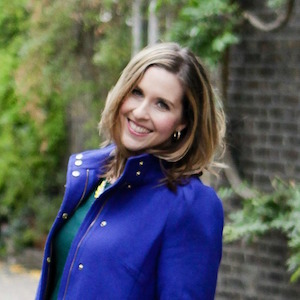 The Brussels sprouts are best when roasted and salty (like french fries)!